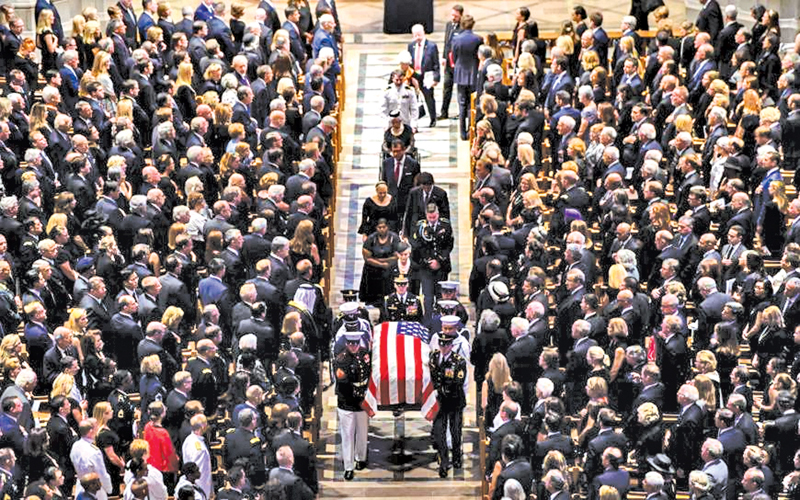 US: Two ex-Presidents from opposing parties united Saturday to honour US Senator John McCain, in a momentous funeral that championed his aspirations of political comity but also rebuked the tribalism and division trafficked by Donald Trump. Meanwhile, Donald Trump has been criticised for playing golf and launching a Twitter rant about Canada during John McCain’s funeral. Leading political figures, including three former Presidents - Barack Obama, George Bush and Bill Clinton - came together to pay tribute to the late senator from Arizona. But the current US President, who was not invited to the memorial at the Washington National Cathedral, decided to head to a Virginia golf course. Some Twitter users quickly urged Mr Trump to “show some respect,” asking him to stay off the platform while McCain’s funeral took place at the US Naval Academy in Annapolis, Maryland. President Trump reportedly arrived at the golf course just as the funeral was getting underway. And while Republican George W. Bush and Democrat Barack Obama offered subtle swipes at the current commander in chief, McCain’s daughter Meghan used the words of Trump’s campaign slogan to deliver a searing, unmistakable rebuke. “The America of John McCain has no need to be made great again because America was always great,” she said, to extended applause. 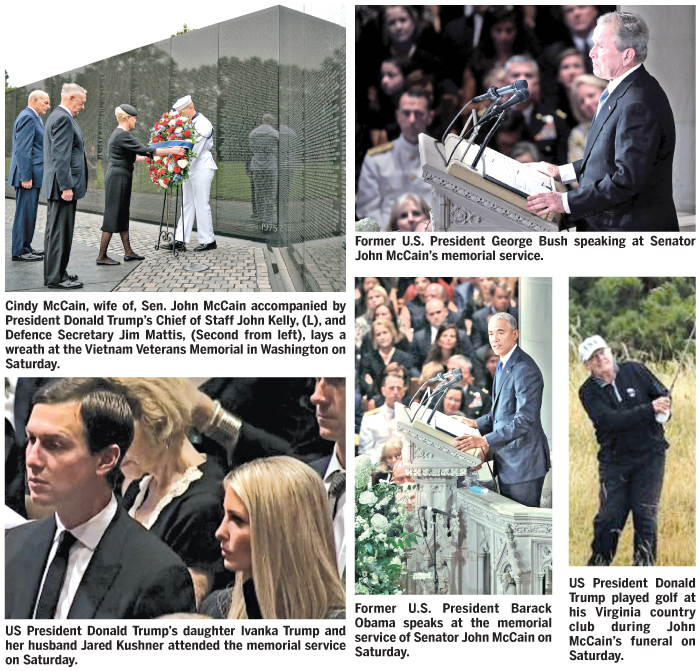 As Bush and Obama praised McCain for repeatedly placing country over party or self, the stunning contrast between the unifying ceremony under the neo-Gothic arches of Washington National Cathedral and an outcast Trump only highlighted the astonishing state of US politics. Hailing his friend as “an extraordinary man” who embodied what is best in America, Obama said McCain, who battled fiercely but respectfully in the political arena, “made us better presidents -- just as he made the Senate better, just as he made the country better.” He was echoing similar sentiments expressed minutes earlier by Bush, who defeated McCain in a “hard fought” Republican primary battle in 2000, only to see that bitter rivalry melt away into a lasting friendship. While Bush and Obama hail from different parties, their message Saturday was clear: US politics can and should rise to a higher level with the example set by McCain. “We never doubted the other man’s sincerity or the other man’s patriotism -- or that when all was said and done, we were on the same team,” Obama said of his rough but respectful campaign battles with McCain. So much of today’s politics, “our public discourse, can seem small and mean and petty, trafficking in bombast and insult,” he added. “It’s a politics that pretends to be brave and tough but in fact is born of fear. John called on us to be bigger than that.” McCain’s final public ceremony before his private burial Sunday at the US Naval Academy in nearby Annapolis, Maryland highlighted the warrior politician’s call for healing. “Perhaps above all John detested the abuse of power, could not abide bigots and swaggering despots,” said Bush, as Trump’s daughter Ivanka Trump and her husband Jared Kushner sat in attendance. Trump’s Defense Secretary Jim Mattis and White House Chief of Staff John Kelly were also present. McCain, who died last Saturday at age 81, has been lionized over the past week of emotional commemorations, including his congressional colleagues bestowing him the rare honor of lying in state in the US Capitol on Friday. And while Trump’s name was not mentioned during the ceremony, McCain’s daughter drew a clear and damning distinction between her father and Trump’s combative politics. “We gather here to mourn the passing of American greatness -- the real thing, not cheap rhetoric from men who will never come near the sacrifice he gave so willingly,” she said, criticizing “those who lived lives of comfort and privilege, while he suffered and served.” Earlier Saturday, the flag-draped casket of McCain, a prisoner of war in Vietnam for more than five years, was taken by honor guard from the US Capitol and placed in a black hearse. It stopped at the Vietnam Veterans Memorial to allow his widow Cindy McCain to lay a wreath honouring all who died in the conflict. She had been stoic throughout days of commemorations for her husband, but on Saturday during opera singer Renee Fleming’s performance of the ballad “Danny Boy,” she lay her head on son Jack’s shoulder and wept. “Today we lost our hero, our friend, our mentor, our father, our grandfather and our husband. Together we mourn and together we go on,” she wrote on Twitter.